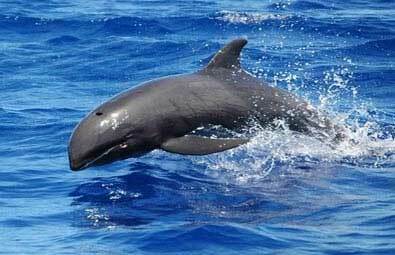 The species is called false killer whale because it shares a lot of attributes with the killer whale. Like the orca, they kill other marine mammals; however, the two species are not closely related. This mammal is the third largest member of the oceanic dolphin family delphinidae. The false killer whales are gregarious and form strong social bonds sharing food and forming tight knit pods. However, this bond increases the risk of mass standings. They are usually found in groups of 10- 20 and are often found with other cetaceans, most notably bottlenose dolphins, which have been known to suffer attacks due to discrepancies over food. To increase the success of finding prey these whales have the cognitive ability to travel in a broad band of individuals, thereby covering a larger surface area that can be up to several miles wide.